For years, the United States has been portrayed by both international and domestic interests as an environmental outlaw, because of its high rate of greenhouse gas (GHG) emissions. 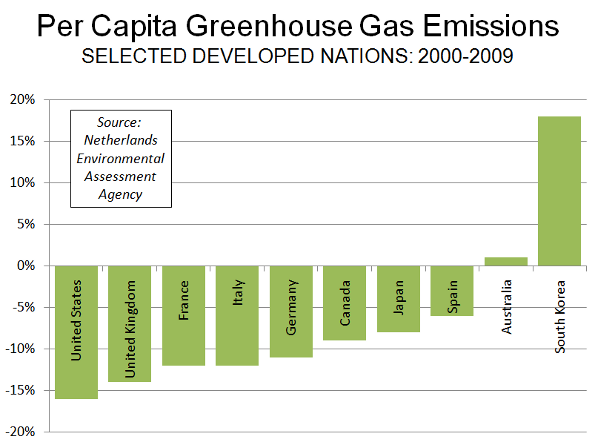 The United States, Canada and Australia have the highest GHG emissions per capita in the world. Further, the United States has historically had the highest overall GHG emissions, until having recently been passed by China. It is likely to come as a surprise that the US has become a model for its reduction in GHG emissions over the last decade. According to a report by the Netherlands Environmental Assessment Agency, GHG emissions per capita fell more in the United States from 2000 to 2009 than in any other area reviewed. 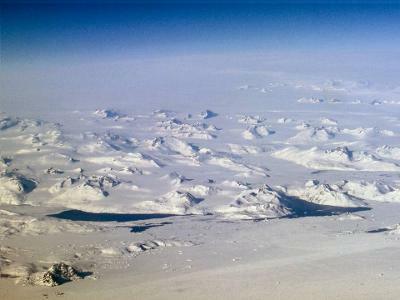 The Agency also reported that there had been no growth in global GHG emissions in 2009. Per capita GHG emissions fell 16% in the United States from 2000 to 2009. This is half again as large as the 11% reduction in the highest income portion of the European Union (EU-15). Among EU-15 nations for which data was provided, per capita GHG emissions were down 14% in the United Kingdom, 12% in France and Italy, and 11% in Germany. Spain, where economic reality is forcing a reduction in support for its highly touted "green" energy program, reduced per capita GHG emissions by little more than one-third the US rate, at 6%. The Netherlands achieved a 3% reduction (Figure). In both the United States and Europe, the deep recession contributed to a reduction between 2008 and 2009. Between 2000 and 2008 (pre-recession), US GHG emissions per capita declined 9%, while EU-15 emissions declined 7%. Canada's GHG emissions declined 9% from 2009 to 2009, while Japan's per capita GHG emissions declined at one-half the US rate (8%). Australia's emissions rose 1%, while emissions per capita rose 18% in South Korea. GHG emissions per capita increased in all of the developing nations surveyed except for the Ukraine (-12%) and Brazil (-1%). Such increases are not surprising, as people in developing nations move from the countryside to urban areas and as they seek greater affluence. There was more good news for the United States. Biofuel use in road freight transport was more than double that of the European Union (EU-27). This is significant because road transport volumes in the EU-27 are nearly the same as in the United States. Submitted by jakebercher4 on Sun, 06/07/2015 - 07:14. Submitted by jakebercher4 on Sat, 06/06/2015 - 06:09. Submitted by filippo.vespa36 on Wed, 06/03/2015 - 13:13. Submitted by johnz308 on Thu, 05/28/2015 - 13:03. Submitted by johnz308 on Thu, 05/28/2015 - 12:56. Submitted by johnz308 on Thu, 05/28/2015 - 10:07. Submitted by johnz308 on Wed, 05/27/2015 - 23:55. Submitted by johnz308 on Wed, 05/27/2015 - 12:55. Submitted by johnz308 on Wed, 05/27/2015 - 10:38. Submitted by johnz308 on Wed, 05/27/2015 - 00:44.